This is a car you could drive to the track, and on it, without making many adjustments. Chevrolet’s Corvette has been recognized for more than 60 years as one of the finest American sports cars ever built. Because it has consistently stuck to its roots, the Corvette feels like both an icon and a throwback. Guess what? It’s still pretty boss. The 2017 Grand Sport version boasts a 6.2-liter V-8 engine that makes 460 horsepower and 465 pound-feet of torque, is mated to a seven-speed manual transmission, and promises zero to 60 mph in 3.6 seconds and a top speed of 181 mph. Like its predecessors, it’s still a front-engine, rear-wheel-drive, two-seat sports car, long on performance and short on practicality. There’s also a button for adding or removing traction control, aka tire-spinning. Those, combined with Chevy’s magnetic ride control suspension system and the very usable manual transmission, make for a thrilling driving experience. In sport and track modes, the power is tractable, but not terrifying, as it is on the Corvettes that come with 650 horsepower, for example. This is a car you could drive to the track, and on the track, without having to make many adjustments. Other thoroughly modern touches include a “hill hold” feature that makes manual gear shifting a lot easier on a slope; optional heated and ventilated seats, with all sorts of lumbar adjustments; optional heads-up display (which showed gear selection as well as speed and speed limit); standard 8-inch navigation screen with back-up and “curb view” camera; as well as 4G LTE technology, Chevy’s MyLink system and both Apple CarPlay and Android capability. There are three USB ports, and wireless and plug-in connectivity for cellphones. The model I drove was equipped with the Z07 “performance package,” which includes an upgrade in suspension, ceramic Brembo brakes and very sticky “summer only” Michelin Pilot Sport cup tires. Unwinding it a little on some empty roads, I laughed out loud a couple of times as the Vette braked into a turn, and accelerated out of it, with just a hint of rear-end slide. On the outside, the Grand Sport is lovingly linked to preceding decades of Corvette lines. Its muscular shoulders and blunt back end are reminiscent of the “Mako Shark” look of the late 1960s models. But the sleeker, lower front end recalls the C5 Corvettes of the 1990s – but with the wide, low mouth introduced in the 2000s. 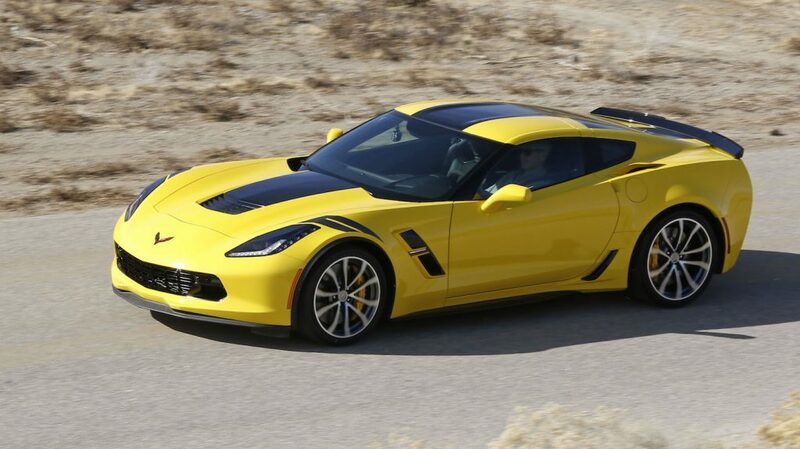 Structurally, the 2017 Grand Sport is built on a Z06 chassis, with body work that resembles the Z06 without the tall hood. It shares suspension, wheels and tires with the Z06, too. It sits slightly wider than a standard Corvette, and has correspondingly wider fenders and rear quarter panels. It has the limited storage capacity you’d expect from a sports car, about 15 cubic feet on the hardtop and 10 cubic feet on the convertible. It also has the limited fuel economy. Despite a cylinder de-activation system that cuts the V-8 down to a V-4 when full power isn’t needed, the Grand Sport has an advertised combined 19 miles per gallon. Driving in “sport” mode a lot of the time, I don’t think I averaged above 15 mpg for the full tank of gas that I burned. I remember the first Corvette I saw. It was a 1963 split-window Sting Ray, light blue, parked on the street in Houston. I thought it was the most beautiful car I’d ever seen. Fifty years hasn’t changed my opinion much. The Grand Sport is still a good-looking car, easily distinguishable from its other Vette brothers by color selection and design adornments such as a carbon-fiber roof and color-coordinated racing stripe hash marks over the front wheels. The one I drove was “Corvette Racing Yellow,” with Satin Black highlights. Other color options include Watkins Glen Gray Metallic, Black Rose Metallic, Sterling Blue Metallic and Admiral Blue. There is also a “Collector Edition,” limited to 1,000 vehicles, with special “Tension Blue” hash marks. Chevrolet doesn’t sell a lot of Corvettes, as a percentage of overall sales, and the total numbers have been falling lately. In 2014, the company moved 34,839 units. In 2015, that number fell to 33,329. This year, through November, Chevy had sold 27,286 of them. But the Corvette is still, along with the Camaro, the brand’s principal “halo car.” Chevrolet is going to keep making them for those 55-year-old male customer who are the Corvette’s core buyer. That customer is going to like this model a lot.